Here's a backlist title for #MiddleGradeMay and I'm kicking myself because it took me so long to pick it up. I've recently read Erin Entrada Kelly's latest book and it made me want to go back and pick up the one that I missed. 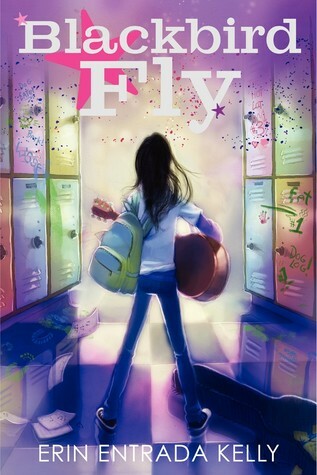 Blackbird Fly (Greenwillow, 2015) is a favorite booktalk title of one of my school booktalk partners and I can definitely see why! This is a raw and realistic portrayal of middle school bullying. Apple is on the Dog Log, a list of the ugliest girls in school that the boys come up with each year. Apple knew she didn't have many friends and the popular kids sometimes said mean stuff to her, like calling her a dog-eater because she is Filipino. But to be on the Dog Log? There's no coming back from that. Apple's plan is to get a guitar, learn how to play all her favorite Beatles songs, and then run away to become a street musician and ditch this middle school life forever. Unless... When a new kid shows up at school, a kid who knows nothing about the Dog Log, maybe he'll go with Apple to the Halloween dance. And then maybe she won't seem like such a hopeless loser. As Apple gets to know Evan, she realizes he's very different from the kids she thought were her friends. He doesn't seem to care what people think. He's interested in her Filipino culture. And he might be able to help her turn everything around. As I was reading this, I kept thinking about Blubber by Judy Blume, which I know is a dated reference from my own childhood. But that's the level of meanness going on here, more heartbreaking because I know it happens in schools every day. Apple feels trapped, stuck with "friends" who are mean to her because it's better to be with someone who makes fun of you than to be alone. Music is a savior and a healing agent here. Apple listens to her Beatles albums over and over again. The Beatles are a connection to her dad who died in the Philippines and they are a bridge to her future. Apple envisions a future writing and performing songs, even as her mom refuses to support her, saying that she won't make any money or get a good job by studying music. As we go through the story, music starts bringing people together. This is a powerful story that will speak to victims of bullying and it's one that you should definitely have in your RA repertoire for when that question comes up. Hand this to kids who like Wonder by R.J. Palaccio but don't mind a rather more bleak outlook. Kelly's latest novel You Go First would also make a good readalike with a similar tone and outlook on middle school life and how kids who are different are treated. Readers interested in the musical aspects of the book should definitely check out Clayton Byrd Goes Underground by Rita Williams-Garcia (Amistad, 2017), which has a similar theme of a talented musical kid whose parent doesn't approve of his plans to be a musician. Other musical novels that might be of interest include A Crooked Kind of Perfect by Linda Urban (Scholastic, Houghton Mifflin, 2007) and Amina's Voice by Hena Khan (Simon & Schuster, 2017). Readers interested in more books about kids figuring out their identities might also like Listen, Slowly by Thanhha Lai (HarperCollins, 2015) or The Blossoming Universe of Violet Diamond by Brenda Woods (Nancy Paulsen, 2014). Blackbird Fly by Erin Entrada Kelly. Grades 5-8. Greenwillow, 2015. 296 pages. Review copy provided by my local library. #MiddleGradeMay Week 5: Diverse Books!